A well defined and contoured jawline is often viewed as a sign of beauty and confidence. A well contoured upper face and cheek are recognized as youthful and healthy. As we age the skin begins to lose its natural suppleness and plumpness. The muscles under the jaw tend to pull down the cheeks, leading to loss of jawline definition and flattened cheeks. We lose collagen and hyaluronic acid, leading to loss of volume and skin laxity. Our temples begin to thin and our cheek begins to drift downward. storing volume and structure to the upper face, is the combination of wrinkle reducers ( Botox or Dysport) and hyaluronic acid dermal fillers (Voluma XC or Restylane Lyft). This combination is often referred to as “Liquid Lift” or by different branded names such as a “Nefertiti Lift”. Regardless of what youcall the procedure, patients are using these treatments alone or in combination with Ulthera and/or Thermage to create their own anti-aging phenomenon. Wrinkle reducers such as BOTOX® decrease the muscle activity lifting the neck and bringing back the definition. 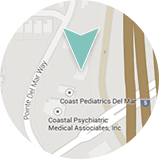 At Dermatology & Laser of Del Mar, Deborah H. Atkin, M.D. uses advanced injection techniques to create volume and provide necessary structure in the upper face to create lift the lower face. By injecting Botox in the lower face, Dr. Atkin can reduce lower-face muscle hyperactivity also giving a lifting and tightening effect. 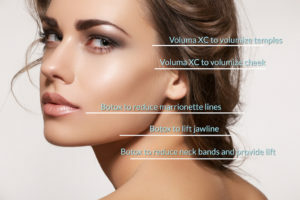 While the Voluma XC or Lyft injections are placed strategically in the upper cheek, lateral cheek and temples, the BOTOX® injections are applied along the lower jawline. This decreases the downward-pull of the cheek by muscles under the jaw. As the ‘downward-pulling’ muscles are relaxed, the ‘upward-pulling’ facial muscles elevate the cheek without resistance. Although it’s a relatively newer application for Botox, the results are proving to be highly-effective for those seeking tighter, tauter skin for a sharp and contoured jawline. Dr. Atkin also injects Botox into the platysmal neck bands in the anterior neck to reduce what is commonly called “Turkey neck”. By decreasing the activity in these bands with small micro injections of Botox, the muscles relax and recede. This will cause the skin to drape differently, pulling back and giving a firmer, more taut appearance. For more information about injectable therapies or combination treatments for lifting and tightening the jaw and neckline and re-volumizing the face, contact us to schedule your consultation.